story by Dana HenryAlmost 10 years ago, Sandor Katz, the self-proclaimed fermentation fetishist, wrote and published the ‘zine-turned-book, Wild Fermentation, a DIY bible for making food with healthful bacteria. 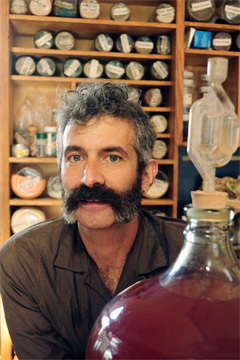 After a second book and years of touring, educating and meddling with microbes, Katz is back with his third and most comprehensive text on fermentation. The Art of Fermentation further documents his fascination, offering guidance for sour tonic beverages, meat, fish, nuts and countless other foods as well as practices for agriculture, art and energy production. Sandorkraut, as Katz has been lovingly nicknamed, has been fermenting for more than 18 years and spreading his passion for bacteria-enhanced foods almost as long. Your can hear from the kraut king himself on June 5, when he speaks at the Free Library of Philadelphia. Grid: What does fermentation mean to food activism? Sandor Katz: When people are really excited and full of hope that change can happen, they get bubbly. They want to share ideas. As a metaphor, fermentation is how social change happens. In a literal sense, for people who find social change in reviving the local food system, fermentation just fits right in. Whether for preservation or health, a big piece of reclaiming our food, and the processes, is fermentation. It’s one of the major ways that people around the world process their food. By some estimates as much as one third of all foods are processed via fermentation. Grid: What motivates your workshops, talks and education? SK: There’s a huge amount of fear in our culture. So many people fear that if they ferment something without a degree in microbiology and a microscope, they might get the wrong bacteria. Reclaiming fermentation is empowering ourselves with ancient wisdom for how to use food in safe and effective ways. Grid: Any advice for beginners? SK: Fermenting vegetables, making foods like sauerkraut and kimchee is an ideal gateway. It’s simple and safe. But whatever ferments that you’re curious about, know that it’s possible to make; it’s just a matter of figuring out how. If you want to make an African sorghum beer, you can do it. If you want to make a Spanish-style salami, you can do it. There’s no ferment that’s not possible for someone with an interest in learning.